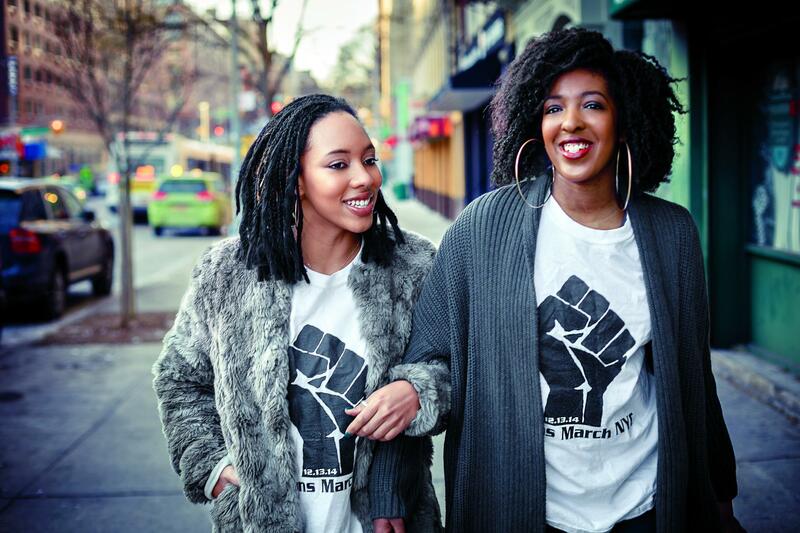 Fed up with the spate of police violence against unarmed Black men and women, classically trained dancers Synead Nichols, 23, and Umaara Elliott, 19, took action. The result: Millions March NYC, an organized protest last December in which a reported 30,000 supporters showed up. Here the artists talk to ESSENCE about conquering fear and keeping the fight for justice alive. ESSENCE: How did you two come together to create Millions March NYC? SYNEAD NICHOLS: I went to Union Square in New York City to hear the grand jury’s verdict in the Darren Wilson case. When I got home, I kept thinking, What do I do? I said, You know what? Facebook. Arab Spring did it, Brazil did it, Mexico did it, so why can’t New York do it? I made the Facebook event and added Umaara as a host. NICHOLS: You had folks connecting themselves to Millions March NYC, offering their help and spreading the word. Those in Ferguson laid the groundwork. If it weren’t for their dedication, I don’t think people would feel as motivated. ESSENCE: What was your main objective for Millions March NYC? ELLIOTT: We wanted to see more Black people on the front lines. I wanted my people to come out, because we were seeing fewer people who looked like us at a lot of the protests. If you’re White and you’re chanting, “Whose streets? Our streets!” these are your streets. That’s why we’re out here. These aren’t our streets. This is a Black liberation movement. ESSENCE: What did you learn about working with other activists? NICHOLS: Low ego, high impact. People don’t realize how important it is to have a low ego. You’ve got to be able to collaborate, not just for you but also for the greater good. ESSENCE: Why is it important for young people to be involved in the movement? NICHOLS: Because we’re the ones who are going to be living through this. ELLIOTT: We shouldn’t have to have previous generations still trying to fight for us. We’ll fight now. NICHOLS: We definitely still want to learn as much as we can, but it’s a different time. It’s a different generation. ESSENCE: What advice do you have for youth who want to become activists and organizers? NICHOLS: Don’t feel intimidated. If you believe in it, you should do it. I didn’t know if Millions March NYC was going to happen, but I believed in it enough to make the Face- book event. Faith is real, and it will help you along the way. ELLIOTT: We didn’t go to trainings for organizing. We just followed our guts. ESSENCE: A lot of people will be looking to the both of you for guidance now. What’s next? ELLIOTT: We’re working with other organizations and try- ing to be strategic about merging the arts and activism. NICHOLS: We’re very passionate about the liberation of Black people. And I think much of art right now is imitating life. ESSENCE: How can we keep the momentum going? NICHOLS: If you stop, it stops. You’ve got to stop being scared. You’ve got to open your mouth and be willing to fight. I’ve lost all fear. After meeting families who have lost their children and are still standing up, what do I really have to fear? I used to be afraid to jump in because I’d think, What if I get arrested? What if die? I’m going to die anyway, so I’d rather die for this. This feature was originally published in the March 2015 issue of ESSENCE, on newsstands now!